The history of Big Freight Systems Inc. begins in 1948, when the Coleman family purchased South East Transfer, a four truck operation in Steinbach, Manitoba. Since then, the Coleman’s have worked tirelessly to build a company dedicated to honesty, hard work and exemplary customer service. Over the past 70 years, Big Freight has clearly earned the reputation as a reliable Freight Management specialist, second-to-none in providing efficient and cost-effective Supply Chain Solutions. As Big Freight continues to expand it's operations, we maintain our mission by continually raising the bar and seeking excellence in the freight management industry. 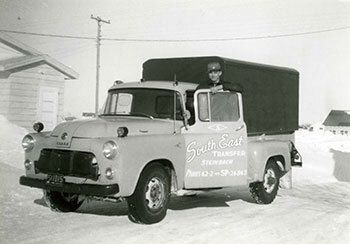 1948 Coleman family purchases South East Transfer, a four truck operation in Steinbach, Manitoba with a general freight operating authority to haul between Winnipeg and South Eastern Manitoba. 1957As the business grows, larger headquarters are built on the original Main Street site in Steinbach. 1959South East Transfer purchases Sarto Transfer, a small three truck operation with routes in Steinbach and to the Southwest. 1960 South East Transfer partners with Penner Transfer to form Bulk Milk Haulers, which operates succesfully until being sold in 2006. South East gains authority to haul poultry. 1972 The new South East terminal is built on Highway 12, consisting of central operations office space with staff parking, as well as a warehouse, loading docks and repair facility. 1975 South East purchases the Short Haul business (Manitoba general freight license) from Penner Transfer, which is held until 1996 and then sold to Dawson Road Transfer. 1980 South East acquires various general freight operating authorities for Canada and the U.S.A.
1991 South East merges with flat deck division of Reimer Express ("Big Freight"), which doubles the operation. 1995 Company moves into the new Operations facility in Steinbach, Manitoba consisting of 3 buildings totalling over 43,000 sq. ft. on 30 acres of land. 1996 Company name officially changes to Big Freight Systems Inc.
1997 The Coleman family acquires 100% ownership of the company and Installs state-of-the-art Satellite Tracking System for all trucks. Big Freight receives the prestigious Top 50 Best Managed Privately Owned Companies in Canada Award. 1998 The company celebrates 50 years of service. The operation consists of 650 pieces of equipment, specializing in Flat Deck and Step Deck freight running throughout Canada and the U.S.
2004 Big Freight acquires a small freight brokerage operation and officially opens the Logistics Division. 2006 The company opens its retail maintenance operation under the name FleetPro Maintenance Services. 2011 Big Freight acquires the warehousing operations of Paramount Storage and officially opens its Warehousing Division, consisting of 400,000 sq. ft. of storage capacity in Winnipeg, MB. 2012 Big Freight is recognized with the Shipper's Choice Award. 2013 Big Freight is once again recognized with the Shipper's Choice Award. 2014 Big Freight receives Shippers Choice Award and the Carrier of Choice award. Founder, Seaton "Red" Coleman celebrates his 90th birthday. 2017 Big Freight is the first Canadian company to join Daseke, Inc.
2017 Big Freight is once again recognized with the Shipper's Choice Award. 2018 Kelsey Trail Trucking merges with Big Freight Systems, adding 80 tractors and 90 sets of 5-axle Super-B flatbeds. Kelsey Trail has locations in Innisfil, ON and Saskatoon, SK.